My name is Dusan Vukovic and I was born in Brcko (Bosnia), 1957 th year. I graduated in painting at the Sarajevo Academy of Fine Arts under Professor Ljubomir Perčinlić 1984. 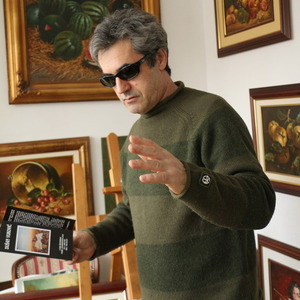 Occasionally, a resident and visiting exhibits in Italy and Switzer, since 1992. he lives and works in Belgrade. To be a painter is a very lonely occupation... If my paintings caught your eye and made you stop and look,than you... This is a great honour for me as it proves to me that my loneliness was not in vain.